Internet Club, made with Emilie Brout et Maxime Marion. Le Copie Copains Club is a club of friends who are coping each other. 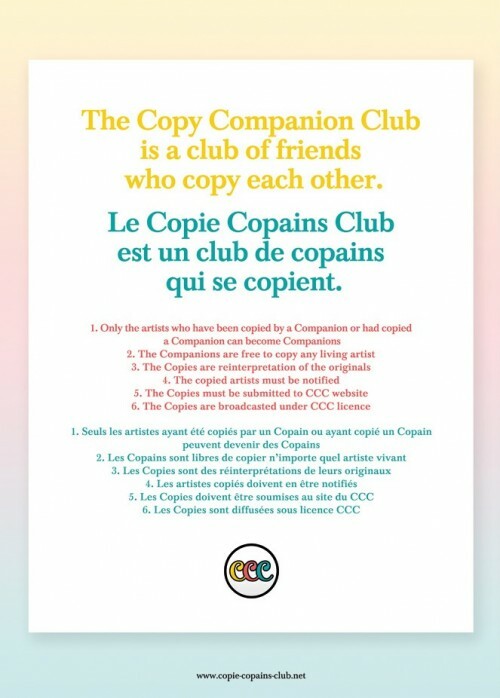 The Copie Copains Club (Copy Companion Club) is a club of friends who copy each other. Inspired, among others and in disorder, of the Surfing Clubs, the Creative Commons licenses and the Mickey Club, CCC aims to highlight the art of copy in the post-Internet era. Today, the artworks and their representations that circulate on the web become themselves available materials, ready to be replayed by other artists. At a time when production companies and governments strive to prohibit any copying, CCC wants to be a space where everyone can freely enjoy the copying, a playground where geek designers as contemporary artists, from all generations and countries, can question their relation to intellectual property and their own creation.